The All Progressives Congress (APC) finally subdued the Peoples Democratic Party (PDP) yesterday as the Independent National Electoral Commission (INEC) announced its candidate, Alhaji Gboyega Oyetola, as the eventual winner of the Osun State governorship election. The Returning Officer, Prof. Joseph Fuwape, said Oyetola prevailed over PDP’s Senator Ademola Adeleke, his main opponent at yesterday’s supplementary election, the main one held last Saturday having ended inconclusively. It was a clean sweep for Oyetola who had trailed behind Adeleke by 254,345 votes to 254,698, leaving a margin of 353 votes. At yesterday’s contest held in seven units across four local governments of the state, the APC cancelled the negative margin, besting the PDP flag bearer by a margin of 472 votes. Fuwape said Oyetola scored 1,150 votes at yesterday’s duel to bring his haul in the race to 255,495 votes, while Adeleke got 325 more votes to close up at 255,023. Specifically, the APC scored 299 votes in Osogbo LGA; 280 in Orolu; 455 in Ife South; and 126 in Ife North. He said the PDP garnered 165 votes in Osogbo; 122 in Orolu; 36 in Ife South and two in Ife North. 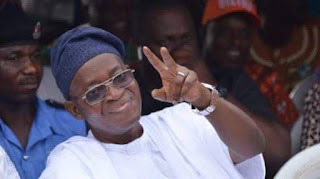 Announcing the final results, Fuwape, who is also the Vice Chancellor of the Federal University of Technology Akure, said having scored the highest number of votes, Oyetola was returned as the winner of the governorship election and Governor-elect of Osun State. Adagunodo explained that thousands of eligible voters were chased away from their homes in Orolu, Ife North and Ife South in the early hours. He said, “Scores of our supporters in those local governments were shot and matchetted on their way to polling centres and in the full glare of security men. Hundreds of people holding PVCs from other polling units were accredited and allowed to vote in Osogbo and Ife South Local Government Areas. PDP agent in Olode was axed and abducted about 7a.m. yesterday. He asserted that the PDP win in the first ballot was a surprise. Apart from Ward 5 Unit 17 in the Osogbo metropolis, polling units in the remaining three local government areas were domiciled in far-flung areas that were not easily accessible. However, the election was characterised by heavy presence of security agents and a good turnout of voters. Officials of INEC arrived the polling units on time. In order to quicken the process, more polling booths were provided. Card readers were deployed to accredit voters in all the units visited by THISDAY and the process was largely peaceful. Few cases of conflicts were reported, but the situation was quickly brought under control by vigilant security agents. Osun State Broadcasting Corporation (OSBC) reporter, Mr. Tosin Oladokun and Kaftan Television crew led by Mr. Jude Ochinma, were attacked by suspected hoodlums in Ward 5 Alekuwodo, Osogbo, where the governorship rerun was conducted. The hoodlums reportedly damaged the OSBC official vehicle and seriously wounded the crew who were on official assignment to cover the exercise. Security agents in the area, including military personnel dislodged the suspected thugs who laid siege to Akindeko market but were unable to arrest the culprits. Acting Chairman, Osun State Council of the Nigeria Union of Journalists (NUJ), Mr. Kehinde Ayantunji, who was at the polling unit at the time of the attack, confirmed the incident. He said the police intervened swiftly but were unable to apprehend the culprits, who fled when the police stormed the scene of the attack. He described the action as regrettable, saying media must not at time be the victim of electoral violence. The police also arrested a woman and two middle aged men at the polling unit on Adewale Street, Ward 5, Unit 17 Alekuwodo in Osogbo local government area for alleged possession of voter cards belonging to other polling units. Agents of some political parties had raised the alarm over the presence of the persons, who were not registered voters in the unit. Security operatives intervened to bring the matter under control by taking the individuals away. Also, some supporters of a particular political party in the state were arrested for possessing assorted charms and Indian hemp at a polling unit in Osogbo. Earlier and before the announcement of results, PDP National Chairman, Prince Uche Secondus, had called for the cancellation of the supplementary election, saying it was fraught with malpractices. Secondus spoke at a press conference in Abuja, where he said the state was under siege as security agencies deliberately chased away journalists, observers and supporters of the party from exercising their basic rights. The party lamented that if what happened in Osun is what would happen in the 2019 general elections, the future of Nigerian democracy is bleak, warning that the country is sliding into crisis. Secondus stated: “Today we are all aware of the rerun election in Osun State as we address the press conference. We, the members of the National Working Committee (NWC) have reviewed what has happened since, from the distribution of materials to the actual voting that has taken place in some of the units and wards.